In 1998, the United States Department of Labor introduced O*NET as a replacement for its aging Dictionary of Occupational Titles (DOT). Both products were designed to catalog and describe the jobs that exist in the world of work. What made O*NET revolutionary was the taxonomy; this created a common language for which to describe various aspects of an occupation. Instead of having job titles and simple text descriptions like the DOT, each occupation was now ranked against the same elements as all the others. This new product paved the way for a series of programs and websites which would allow users to explore occupations in many new and exciting ways. There are lots of things that O*NET could facilitate, but by itself it is simply a database. This makes it great for researchers who wanted to get at the raw data, but tedious for everyone else to explore. Recognizing the lack of a good interface, several state entities participated in a pilot program to utilize O*NET in user friendly ways. Among the participants was the New York State Department of Labor who, in collaboration with representatives of Iradix Consulting, developed CareerZone. CareerZone started as a simple and easy to use system designed to allow students to quickly begin exploring careers. It allowed users to take assessments to see what occupations they might be suited for, view detailed occupational profiles and videos, and even see what the wages and job prospects might be. As time went on, the system continued to add new features and even picked up several awards. With each new version, the system was becoming tied more and more to New York State. Recognizing this, Iradix began work on what would become the Headed2™ platform. Headed2 was designed to be flexible, and allow clients to customize the look and feel as well as the content so that they could have a fully functional career exploration system, without having to start from the ground up. 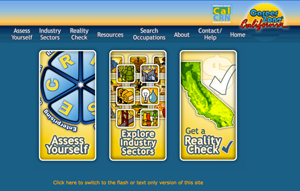 In 2003, the California Career Resource Network (CalCRN) contacted Iradix to develop a site similar to what New York was offering. This was a great opportunity for Iradix to test out the Headed2 platform. We scheduled an initial meeting to discuss the details of the site including its target audience, goals, and what look and feel might embody California. After discussing, we got to work on the details. We wanted to incorporate many elements that were distinctly California. Since the site was going to be focused on students, we opted for illustrations over photographs. The feeling was that illustrations could be more playful and appeal to a wider audience and that photos would not be as appropriate for younger students. A distinct challenge with drawings is that they are often taken out of context and sometimes even fairly recognizable landmarks can become indistinguishable. Fortunately, the state has some very recognizable, iconic images including the Golden Gate Bridge and the Hollywood sign. Other imagery was less iconic, but would work in collaboration. Our designers worked closely with CalCRN to create what they had envisioned. These were assembled into the icon sets you see in use today. In the years since the site has launched, it has continued to enjoy a steady increase in visitors. Currently, the site serves several thousand people a day. To facilitate that traffic and make the user's experience all that it can be, we are continually adding to what the site offers. For example a portfolio feature was recently added that allows users to create accounts to save their assessment results and other exploration activities. We also still work very closely with CalCRN to make sure that we are meeting their objectives and making sure that the site is in alignment with any new initiatives that may have. This partnership has allowed California CareerZone to continue to grow. Why not take the system for a spin now, and be sure to check back often as many new features are scheduled to be added over the coming months.